Almora is very famous for its rich cultural heritage, unique handicrafts, sumptuous cuisine and magnificent wildlife, coupled with an easy accessibility, promises a tourist destination of fun.Almora has a striking nature and it falls under the Kumaun region of East of Uttarakhand.It is the cultural capital of Kumaon and is a beautiful scenic place situated at an altitude of 5900 ft.Almora is seated on a hillock, which is in Horseshoe shape and is surrounded by dense forests of fur and pine trees.Himalyas which falls in the backdrop of Almora is an amazing sight with its snow-capped peaks. 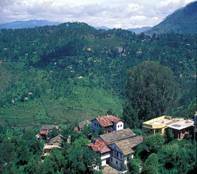 The unplanned lay out of this town shows that Almora is still in the cradle of nature. Thus travellers continue to flock this town to get the glimpse of snow glistened Himalayas outlining the blue skies, and get a peace of mind. It is one of the three hill districts of Kumaon,the other two being Nainital and Pithoragarh. Geographically, Almora is bound in the east by the district of Pithoragarh - bordering Tibet, in the west by the district of Garhwal, in the north by the district of Bageshwar and in the south by Nainital district. Almora holds a special place in the history for it was the only hill station which was not founded by the English but instead by Raja Kalyan Chand in 1568.The rulers of the Chand dynasty had Almora as its capital from Champawat. Though there is no written records or archeological evidence of discovery of Almora, it is said that when Raja Kalyan Chand, the ruler of the Chand Dynasty was riding on the horseshoe shaped spur in the act of striving a prey. The hunted quarry saved itself by taking refuge in a thicket of Kilmora, a wild bush and revealed to the royal hunter the site of this town.But however in 1798 AD the Gurkha captured Almora which was soon taken by the British after the Gurkha wars of 1814-1815. This festival falls in the month of September and it takes place in the grounds of the famous Nanda Devi temple. There is also a fair held during this festival which goes for about five days and nearly 25,000 people attend this festival. The festival of Uttraini falls in the month of January which is accompanied by a huge fair where traders from different parts of the country and all the tribals of the hilly region participate.Uttraini festival and fair is organized in Bageshwar, 90 kms from Almora. This is a monsoon festival which is celebrated for nearly a period of one month.This festival is of great religious importance for Kumauni society and even from the historical point of view. 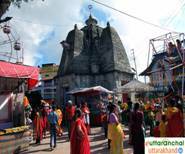 Each day during the festival, approximately 1000 tourists pay visit to Jageshwar temple. Dushhera is another Hindu festival celebrated with same pomp and fun throught out the country. This temple is nearly 1000 years old and the presiding deity of this temple Nanda Devi who was favourite god of Chandravanshi kings. The main feature of the this temple is that it walls are intricately carved attractively with true to life images. 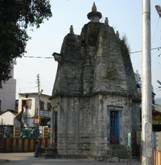 This temple which belongs to the 2nd century is about 4.5 kilometres from Almora.One can get a good view of the town of Almora from this temple. 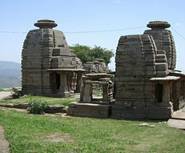 This sun temple is nearly 800 years old and is situated in Katarmal at a distance of about 17 kilometres from Almora.Though it remains in ruins it still has interesting architecture and intricate images carved out on walls. The deity worshipped here in this temple is Golu Devta, deified general of Chand dynasty.Devotees, as thanksgiving offer bells here which are decorated on the canopy of these bells. There is a myth of sacrificing goats in front of this shrine to fullfill wishes. This museum is located near the bus stand and educates the tourists with the culture, life style of this region especially the historic and cultural significance. The main feature of this museum is that it has unique collection of 'Apen', a folk style of painting. Bright End Corner is 2 kms away from Almora.The main attraction of this place is the sunrise and the sunset seen through the Himalayan peaks. This place also has the circuit house where tourists can relax for a while. The other places of interest here is the Vivekananda Library and Vivekananda Memorial which carries many books on literarue and also about Vivekananda. Anantagiri water fall is another prime attraction of this place which is at a distance of about 30 Kms from the Araku valley. You can very clearly here the sound of the waterfall on a peaceful day which will take you away miles away from the buzzling city noise. Khajanchi Mohalla literally means treasurer's area. You can visit the area for glimpses of old style architecture. The area dates back to the times of kings in Almora, it then belonged to the state treasurers. 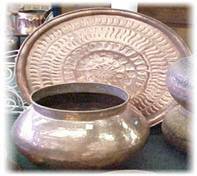 This is a place in Almora occupied by the coppersmiths and the occupation concentrated is all about copperware which is the popular crafts of Almora. This place full of scenic beauty is just 10kms from Almora with a blend of gardens and forests. It is one of the favourite spot for the foreigners and the people coming here like to settle down for the rest of their life. Koshi is again another place of scenic beauty at a distance of about 12 kms from Almora where there is also the Govind Vallabh Pant Research Institute. Pashmina shawls, woolen products like shawls, chutka, carpets and thulma are very popular here. One can also easily get products of ringal like musta and dalia. Apart from that in local art, you will get Kumaon Folk art, decorative candles, drift wood products like ekebanas, statues etc. Copper ware is also very famous here, the city's connection with coppersmiths dates centuries back. The closest airport is Pantnagar, 127 kilometres from Almora. Flights are available during summers . The closest railhead is Kathgodam (90 kms) which is well connected by trains to Delhi, Lucknow, Dehradun, Agra, Bareilly and Kolkatta. Buses ply between Almora and Delhi (380 kms. ), Lucknow (466 kms. ), Dehradun (415 kms) and other important places. Otherwise one can also travel up to Nainital by bus as it is better connected and take buses from there for Almora.